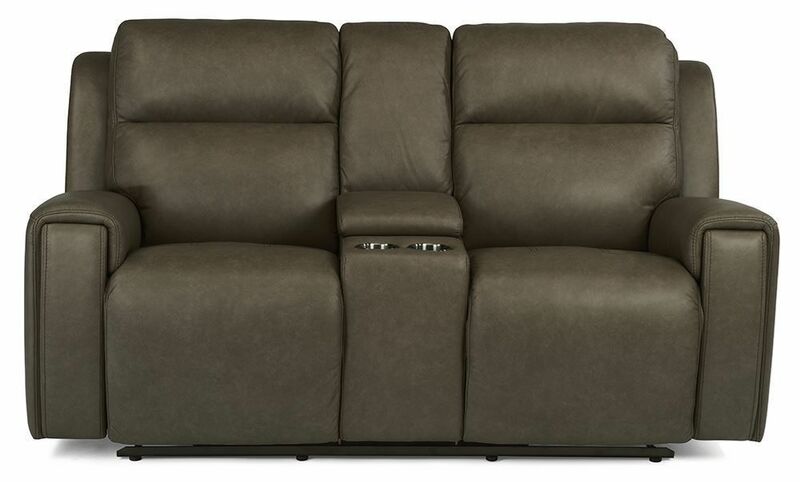 The Jasper Pewter Power Reclining Console Loveseat delights your senses with its comfort, class, and sophisticated styling. Soft and supple, its wrapped in 100% leather, bringing you a high-style aesthetic of the utmost quality. Move from an upright position to a full recline with the mere push of a button and take advantage of the adjustable headrest to customize your comfort to your liking. Featuring the best seats in the house whether you're reading, watching your favorite movie, or napping, this loveseat will bring you superior support and comfort like you've never had before. Welcome timeless design and exceptional quality to your abode and treat yourself to the Jasper Pewter Power Reclining Console Loveseat. If you've set your sights on this power reclining loveseat, you may be interested in furnishing your entire space with the Jasper Pewter Collection. The coordinating pieces are sold separately, allowing you to pick and choose the right ones for your space! The Jasper Pewter Power Reclining Console Loveseat delights your senses with its comfort, class, and sophisticated styling. Soft and supple, its wrapped in 100% leather, bringing you a high-style aesthetic of the utmost quality.